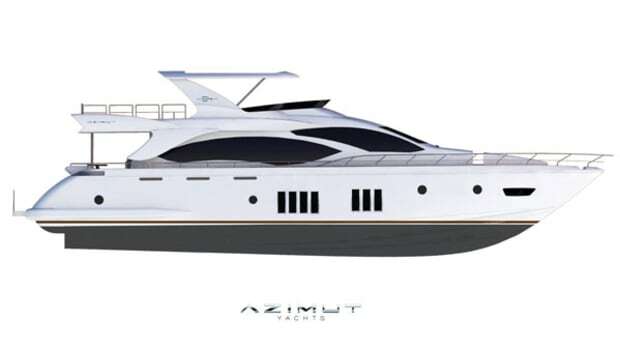 As the new flagship in Azimut's Magellano line, the 76 adds even more features for long-range cruisers. 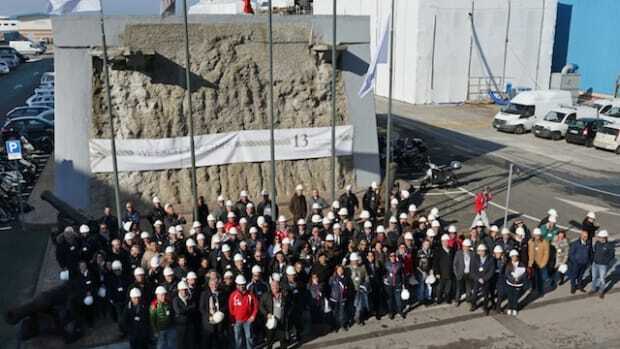 Q: When the Italian builder Azimut announces that it is planning to build a long-range trawler yacht, what might it look like? 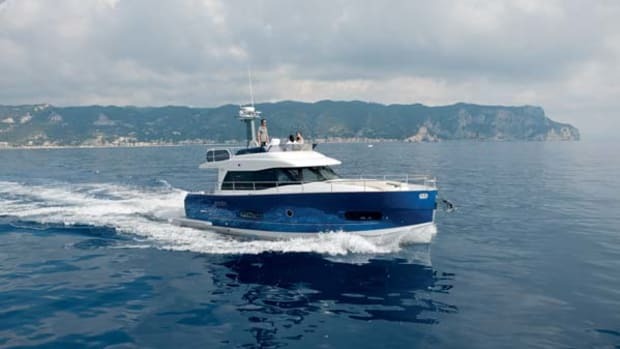 True, the Magellano 76 is a departure from the swoopy euro-style Azimut look of previous models. By comparison, it looks rather chunky and tall. 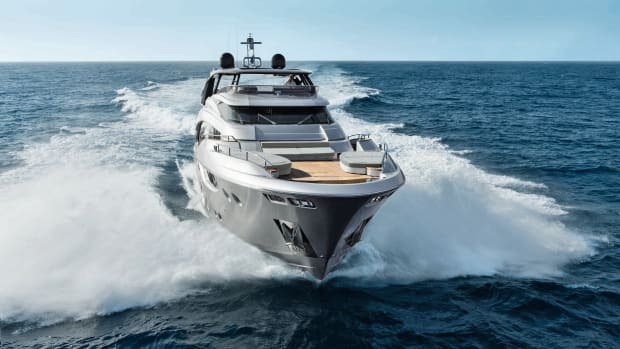 But that’s because Azimut packed a lot of smart features inside, giving this yacht plenty of substance for owners who want to cruise well beyond the next port in style and comfort. 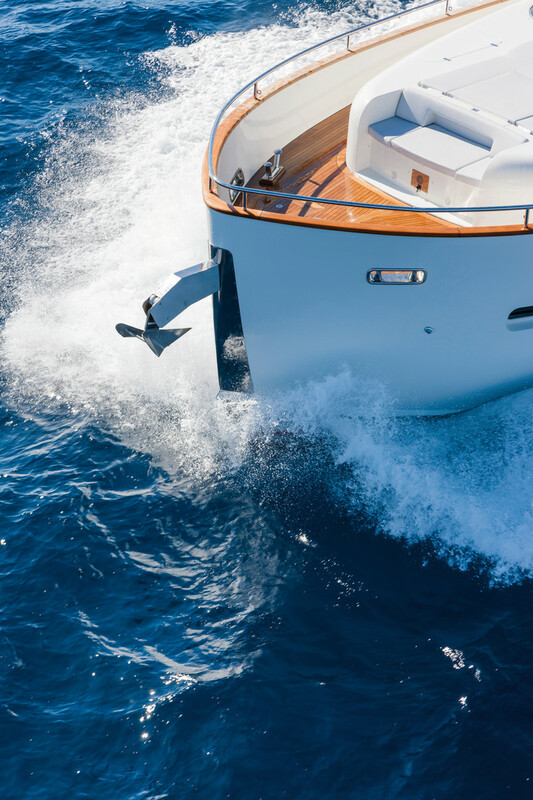 Take the flybridge, which extends more than half the length of the yacht. Instead of filling it with seats and tables that make sense for day-trippers, Azimut left the after half open to become what the Italians might call a terrazza, a terrace overlooking the sea. Sure, you could rig the space to carry a tender, but how much more stylish to have Minotti sun chaises with side tables for evening cocktails on the hook in a far-off port? 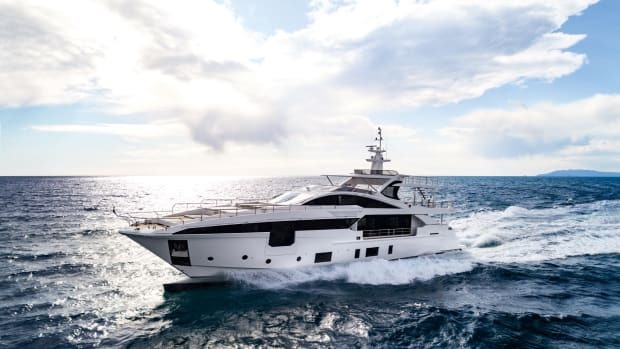 Azimut couldn’t bring itself to commit to plodding trawler speeds, either, so it asked designers Bill Dixon and Ken Freivokh to create what the builder calls a “dual-mode” hull. When you want to go far, you have an 1,850-nautical-mile range at 9 knots. Want to pick up your skirts and get to Nikki Beach for happy hour? Push the throttles and you have a top speed of 22 knots. A teak dining table with settee and loose seating dominates the cockpit, which has full sun protection from the bridge overhang and an electrically powered awning. A seamanlike console is in each corner of the cockpit with warping winches, oversized cleats and line stowage, again, adding long-range cruising substance to the Magellano 76’s style. Step into the salon and you’re greeted by the galley to starboard, a position that is most un-Italian (they like to hide their chefs) and that makes for easy service in all directions. The counter can serve as a bar for both the cockpit and salon, with the galley appliances including a wine and champagne cooler. 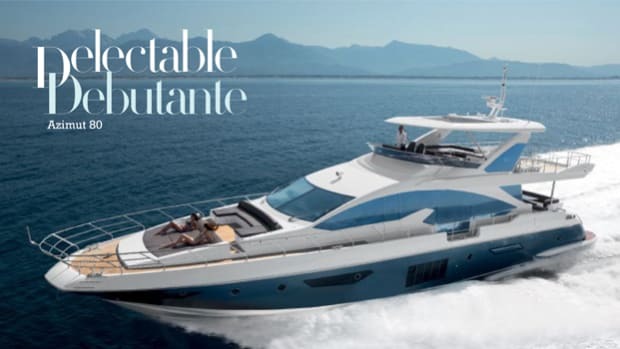 The standard arrangement on the Magellano 76 places a dining table forward to port that seats eight. On my test 76, the owner made what I thought was a good choice: He replaced the table with a couch to enhance the seating and entertaining area amidships. A formal dining table takes up considerable space for something used rarely, and dining areas are available on the aft and bridge decks. 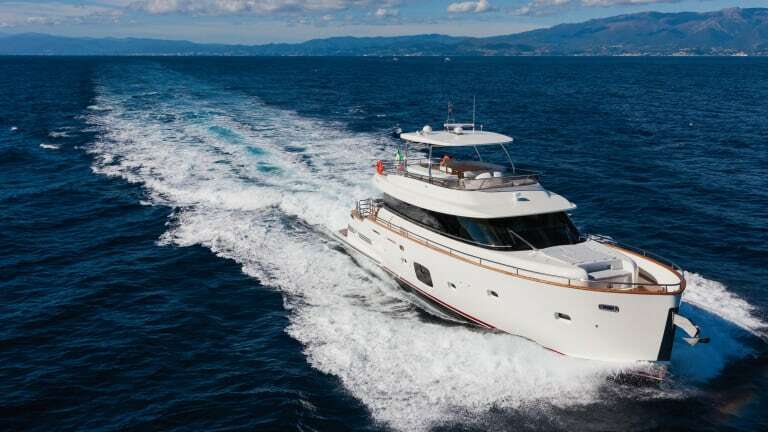 Further underlining this Magellano 76’s distinctions from traditional trawler yachts, Azimut went for elegance in the hardware on the cabinet doors. Simple pulls would have worked, and brass pulls would be expected, but the 76’s are stitched leather in a leather fascia. Just forward of the seating area is a console of Italian walnut—the wood choice throughout. It separates the helm from the salon. 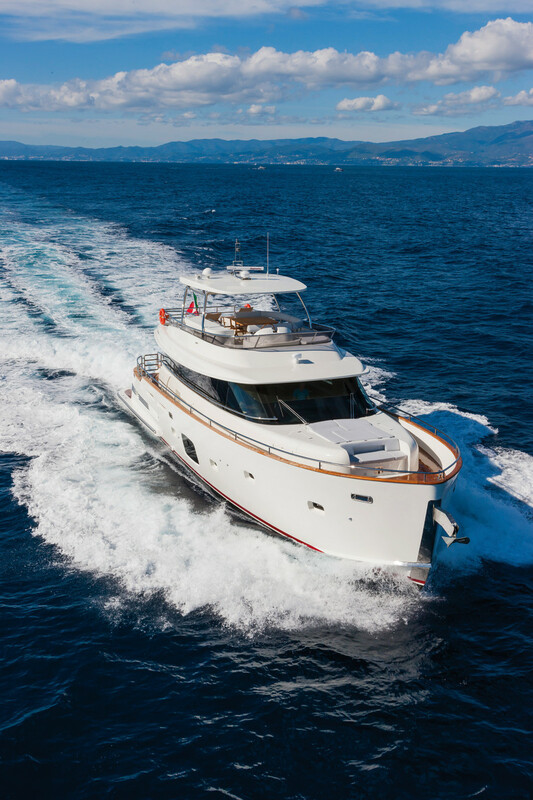 This is an interesting design element, since earlier Magellanos (the series includes a 43, 53 and 66, with the 76 as flagship) had solid bulkheads forward or available as a Navetta option. 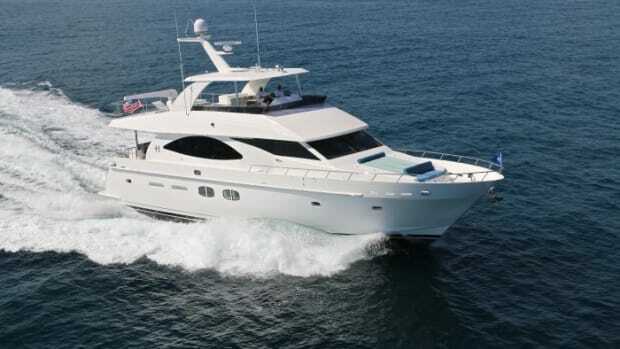 Long-range cruisers like to close off the pilothouse for night running, which suggests the 76 is more a run-until-dark-and-then-anchor yacht. 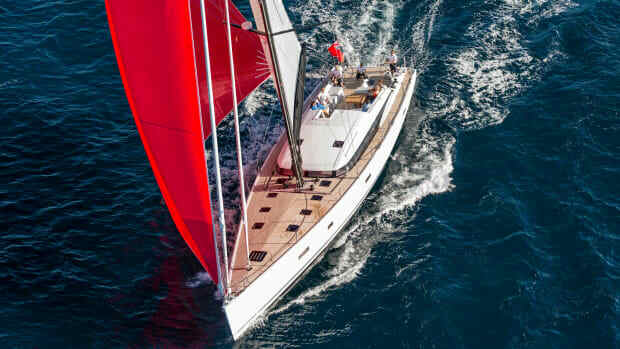 The skipper and mate will have personal comfort and redundant systems, with a pair of leather helm seats and a console with triple monitors and space for black boxes. The bridge is covered in teak planking, and the layout is minimalist: helm forward with a bench seat, a dinette that seats eight facing a barbecue and then, well, nothing. Use the rest of the bridge for chaises, seating or to carry a water toy. The transom platform is already large enough to handle a nearly 13-foot Williams jet tender. A stateroom with twin berths and ensuite head is just forward to starboard, and can be ordered with a clever touch: a door to the master suite, turning this space into an office or attached sleeping area for younger children. The outboard berth folds flush to the bulkhead, and Azimut can outfit this space to suit additional owner requests. Opposite is an upper-lower bunk stateroom with head and shower. Forward is the VIP stateroom. Stowage includes a pair of hanging lockers plus lockers next to and under the berth. Crew quarters are abaft the engine room, with two single cabins, a shared head and a mess area with table and mini-galley. Access is via stairs from the full galley on the main deck, as well as by way of a door to the transom platform. Power for the Magellano 76 is a pair of 1,000-horsepower MAN diesels that, because they are V-8s, are low and compact, creating an engine room with access to all sides of the engines and ancillary equipment. 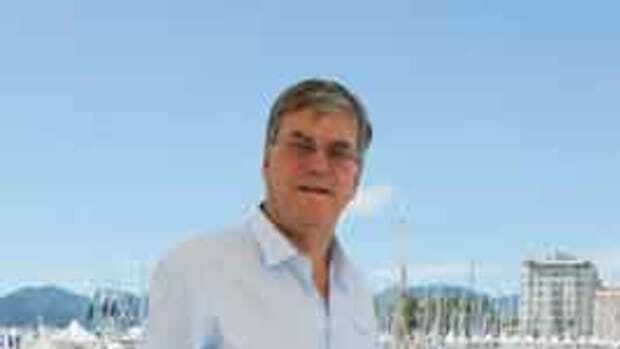 The yacht has hydraulic bow and stern thrusters, and a thoughtful redundancy is hydraulic take-offs from each engine. My test boat also had the optional Seakeeper gyro, in a designed-to-fit area in the lazarette. If your idea of long-range cruising includes visions of fighting the elements while enduring some discomforts, look elsewhere. 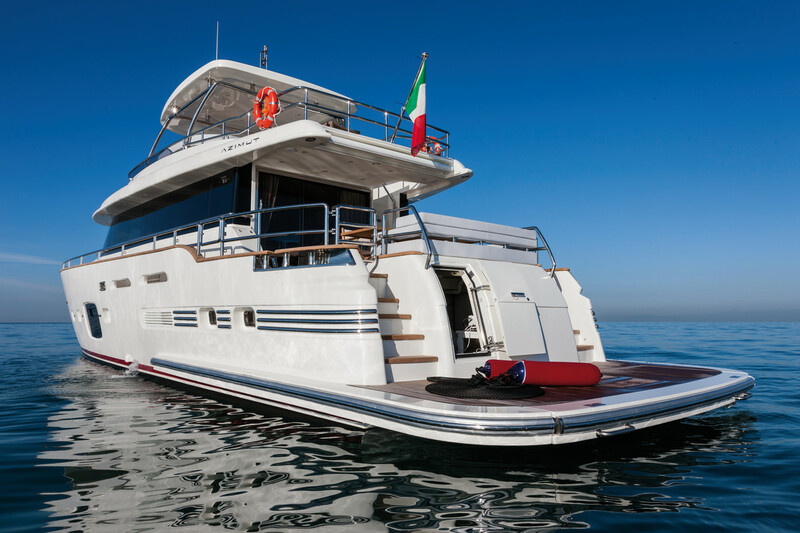 The Magellano 76 is designed to cruise considerable distances and in reasonably nasty conditions—with style and luxury, and with the ability to scamper for shelter at 22 knots. She provides quite a few answers to questions that other builders haven’t even asked, and that left me thinking, Why didn’t I think of that, either?